Our program uses archaeological inquiry to foster understanding of past and present cultures, improve science education, and enhance citizenship education to help preserve our archaeological legacy. We offer both outreach programs at your location and field trips to the Center that support current NGSS and HSS content standards. Our interactive programs bring the fascinating world of archaeology to your school or organization. Each program runs 45-60 minutes and can be customized to fit your needs. Elementary school students become Jr. Archaeologists in this hands-on program, which provides the rare opportunity to learn from actual artifacts. Using skills of observation and inference, students examine ancient and historic artifacts in order to determine their function and modern-day counterparts. Additional unfamiliar objects will also be presented, and students will be challenged to make identifications using contextual clues, just like a real archaeologist investigating in the field! 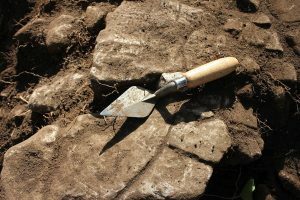 In this interactive and intriguing program, Middle and High School students are shown how archaeologists put together the puzzle of the past once an excavation is complete. The multi-disciplinary approach of archaeology is emphasized as students analyze collections of real ancient and historic artifacts in order to identify evidence of activities, inhabitants, time period, and other site characteristics. Please contact the center for more information or assistance in choosing the right program for your group. We host your group for a memorable and unique learning experience. Field Trips to the Center include 3 exciting archaeology programs, lasting about 3 hours with time and space for lunch. Museum Activities: Archaeology Quest through 10,000 years of local history and multiple interactive exhibits such as Shipwreck: Underwater Excavation, Ceramic Reconstruction, and Artifact Junction. Experimental Archaeology: Learn about a specific artifact class or feature, then make your own to take home. Examples include pottery, rock art, beads and cordage. Unit Mapping and Analysis: Students map and record an excavation unit layer while learning how to infer about what activities have taken place, who lived there, and during which time period. The Education Department will customize a field trip program to fit the needs of your home school group. Full or partial funding may be available for qualifying Title 1 schools.